What happens when a man wants to have his ex-wife killed quietly, but the man he hires to do it is concerned first with his own "brand." Marketing meets mayhem in this transgressive, chicken-fried take on an episode of DATELINE NBC or the classic, pulpy true crime novels. Some in life aspire to be doctors. Some, lawyers. Some dream of helping to advance humanity and die as celebrated heroes. Not Calvin Cantrell. Calvin Cantrell aspires to be a serial killer. The best that ever did it. And he’s roped in Phillip Krandall, a failed psychopath who never made good on his plans for a Columbine-esque massacre at his high school and now merely dreams… “In his dreams, everyone who had ever pushed him around or gave him a hard time…each of them atoned in bloodshed and he absolved them of their guilt”; and Rhonda, Calvin’s wife and a woman who’s been pissed upon more than her fair share by life. 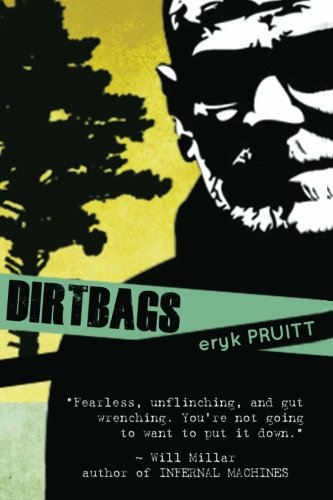 Dirtbags, the debut of Eryk Pruitt, trails Calvin’s journey. This hysterical, blank self-awareness that Calvin has lurks throughout the novel. He often arbitrarily references his favourite serial killers, sometimes mid-conversation, often to the bemusement of those listening. It’s an approach that never runs dry on the mirth. As for the grisly murder scenes themselves, they bear sweet lashings of gallows humour, only bringing the killings into deeper discomfort. You will definitely shift uneasily in your seat a few times whilst reading this book, perhaps even avert your eyes from the page in revulsion once or twice as claret sprays and bodies are left “mutilated beyond the skills of the mortician”. However, there was one particular death scene which sharply stood out. It was so well-written, it possessed almost a perverse beauty to it. I’ll preserve the plot details, but in the scene Pruitt deftly telescopes the prose during the slaying to bring you closer to the scene, closer than you’d like. The syntax is terse, tight. The description staccato, precise. The pace is that of a hunted prey. The victim actually thinks, in a mildly meta moment, “It’s all moving so fast.” You can almost hear the heavy breathing and smell the blood the scene is so intimate and tense. Along the blood-besmirched path of the narrative, the story also delves into the stories of other characters… Tom London, the man who hires Calvin to kill his ex-wife and is responsible for initially sparking his serial killer designs. The ex-wife herself in question. The 809, a grimy stripclub lurking on the edge of town. And a smattering of sleaze-ridden residents of Lake Castor. There are no heroes in this novel. No angels or saviours. There’s a reason it’s called Dirtbags. Almost every character is begrimed in dishonesty, greed, bloodlust, hate and selfishness. Everyone is cheating on and double-crossing one another. It takes skill to cram in so many utterly repulsive dicks and cunts into one narrative, and Pruitt pulls it off. The layered narrative is composed with care and love. Sick, twisted love. The plot interweaves from one character to another, from present to past and back again like a prose-tattooed snake writhing, twisting about. This ever-changing focus stabs dynamism into the narrative. The characterisation is likewise wall-to-wall great. Pruitt fleshes out even minor players, really throwing you face first into the world of Dirtbags. 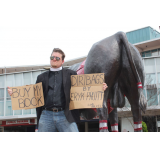 If in the early stages of the novel there is perhaps a lack of confidence in Pruitt’s writing at times, almost inevitable since this is his first swing, very soon in he has definitely gotten into the groove and laid down his own voice and style. The conclusion also deserves a brief, non-spoilery mention. It’s great. Pretty smart too. If you’ve ever wondered over what would happen if American Psycho accidentally copulated with No Country for Old Men… Dirtbags is your baby.